i live in Farnborough (THFB) and connected to cab 31 via a pole on Farnborough Road. 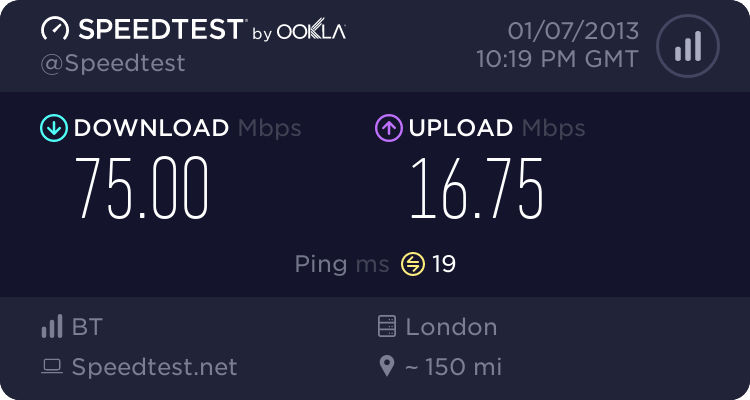 I'm on Sky FTTC, but my speeds are worse than normal sky broadband when i lived half a mile away and was connected to cab 74. I'm getting ~ 16.6 down & 1.3 up, which is in line with the BT DSL checker. I'm 883 meters (strait line) from the exchange, & i'd guestimate ~950 meters from the cabinet (using google earth and tracing a guestimate path following roads, pavements taking the longest route possible to walk). Any advice on what I could do to improve my speed, or who/how to contact to BT/OPENREACH/SKY to try and possibly change to a closer cabinet as i guess that I'm at the limit of fttc connectivity? Its sky you need to call as you pay them.As for getting moved onto a other cab good luck with that as you will need it plus lots of ££££. raise a service ticket with sky and ask if this is correct, or are there any problems. You can always revert back to adsl to get a higher speed. Its strange that the FTTC is slower, if the telephone line takes the same path. Is you phone line ok, or is it crackling. If so, raise that as a fault with SKY and do not mention the broadband fault. VDSL has a very rapid drop in speed, 1km of copper should be around 24 Mbps downstream connection speed, which of course will speed test slower. Three power profiles are used on Openreach cabinets to avoid problems with cross talk to other VDSL lines and the ADSL2+ already in use on other lines. This can be 1km even if identical can perform slightly differently depending on whether cabinet is close to the exchange or a long way away. This scenario of long cabinet line, is not unique perhaps 10% of lines affected. I was comparing broadband speeds with the old house, the line was noisy there even after BT replaced it. At the new house there is no noise on the line. I've complained to sky numerous times and had openreach out 3 times to replace modems and cabling. I really need a different cab, I understand that the house is wired to that cab & it's non trivial to move, but is possible. I found lots of references to the fact that it costs £££££ but no actual figures (please don't post made up costs). If the price was right I'd pay. Shows labour at £120 per hour per person as a starting point. To be honest you might be better off waiting for Fibre on Demand to roll-out as you have FTTC in your area and save up to get the benefits from full fibre optic cable that is then immune to RF noise and distance issues. You are looking at a price in the £2000 to £3000 area to get connected I'd estimate and then higher cost per month but you do get a 330 Mbps service for the money. Awesome, thanks so much for those links. I've been looking for so long and found nonsense. I wonder how long to wait for fttp? As you say that would be the better choice for the money. Ill probably wait till Xmas and see what's on offer, if fttp isn't on the horizon ill investigate moving cab. There's also of course the minor issue of finding someone who'll actually sell it without attaching a business SLA, managed router or whatever and everything else which will make the monthly charge rocket. That's my main issue at the moment, finding an SP who'll put the order through, supply the backhaul to the Internet and go away. I don't require an MPLS service, I don't require a managed router, I don't require any enterprise services just a bleeping FTTPoD install and FTTP provision. I'm in North Camp, and wondering if you're on the Farnborough Road, it would be seriously cheaper to investigate Virgin Media? Had NTL Broadband from 97 ish (512 kbs, had to pay a fortune for the modem too) to 2006. 1st in Lynchford Road, then moved it to to my current address in 2000, then had it at my flat in Aldershot, encouraged family & friends to join them too. Then following the most horrific so called customer service in 2006, i've vowed never to spend a single penny with them ever agin. I'm not one to bear a grudge, but I'd use 9.6 K dial up before i'd go Virgin Media again.